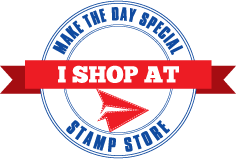 Make The Day Special Stamp Store Blog: Need a hug? Jill here, and today, I'm offering up some hugs! I used the new Paper Smooches 'Comforting Hugs' set again this week. I just can't put it down, such an incredibly delightful set of images and sentiments. The designs themselves are oh so sweet and simple, so I stuck with a pretty simple design of my own. 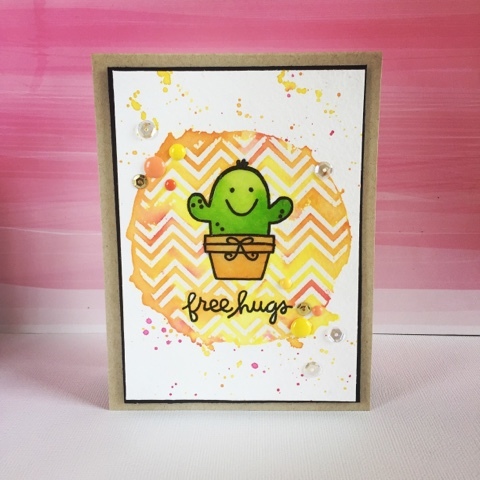 I started by stamping out my sentiment and this cute little cactus onto the centre of my card, and colouring the cheerful little chap using Distress Inks as watercolour. I then gave him a wash of clear Wink of Stella, a layer of Glossy Accents, and left to dry completely. I then created a circle mask, and used a chevron border stamp to create a background within the circle, using Versamark ink and clear heat embossing to act as a resist. Whilst the mask was still in place, I washed over a mix of Distress Inks, (Picked Raspberry, Spiced Marmalade, and Mustard Seed), not taking too much care as I wanted it to spill and splodge around the edge. I then created a few little flicks of the same inks to create a little more interest to the backdrop. I embellished with co-ordinating enamel dots and a scattering of clear sequins, matted onto black card, and mounted everything onto a Kraft card base. This set is one of those rare finds for me, whereby I want to use every single image, and every single sentiment from it! I just think it's so adorable! As always, everything I used is linked below, and I have also linked an almost identical chevron set to the one I used, so be sure to check it out.